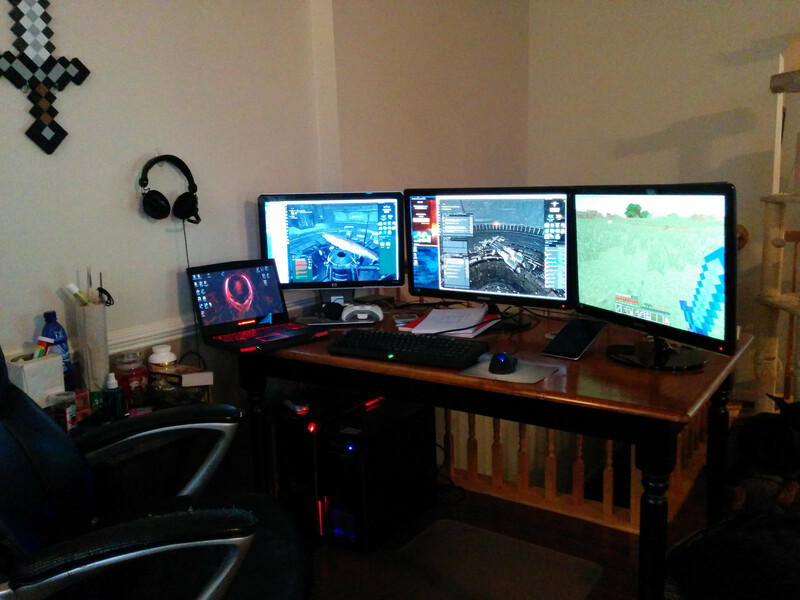 It popped up and some have posted their setups. I've posted mine a few weeks or months ago but why not. Link for anyone who the photo does not work for. I have two boxes on the floor right now. The red one is about to be retired to the server rack for secondary uses. The blue one is my hand me down from my husband. I live in a town house with an open floor plan. My desk is up against the railing to the steps outside. I have windows behind me. We took over half of the main floor as an office/media room. We used to use the basement room and my husband asked one day why we were crowding ourselves in. We don't entertain and we were not using most of our house. It may not be 'right' or 'traditional' to turn your living room into an office but we are a lot happier with it and use more of our home because of it. After all, we pay for the place and its the two of us and the pets. Kinda like the server system in the garage. It works for us. The monitors are a HP W2207h (22 inch) that rotates. The other two are Samsung SyncMaster SA350a (27 inch). My desk is a kitchen table from Walmart and a more sturdy, comfortable desk I have never had. My laptop I sometimes use but mostly it is my portable workstation and I spend time mirroring things over so that I never find myself needing something. It also games quite nicely and is with me on vacation. A future housing project is to match the railings with the floor. That, is still sometime to come and there are other things (like installing tile in the kitchen) that have higher priority.) Also, one of my cats kneeds the arm of my chair and has shredded that one. He can't help himself but to kneed and it is my chair arm or my clothing and skin when he is in my lap. Ahh well. Chairs are replaceable. Having lost this particular kittie's brother earlier this year to age, I'll take the chair damage any day. Odd, the image doesn't show for me (although space and a clickable thingy does), and when clicked on, the image doesn't load. ~le sigh~ one day . . .